How Do I Make a Salad? Time management is essential with today’s modern, hectic lifestyle. The less time you spend on tedious tasks, the more time you have for enjoyment of life. 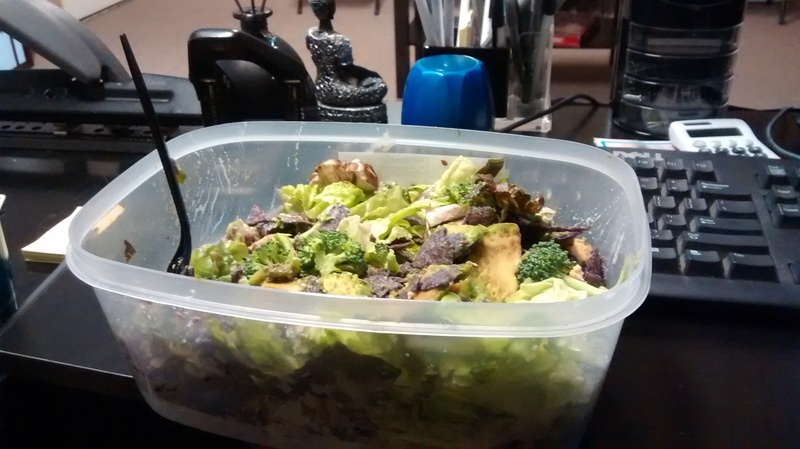 Before I incorporated this routine into my diet, making a salad on a regular basis was either too tedious, too time consuming, or subjected to procrastination on the account of not knowing what ingredients to use. The thought and intent were present but needed a first footstep in the right direction. I mean how hard is it to make a salad…one would think? It helps if you have a concrete base and build from there. Then it is easier to incorporate into your everyday meal plan. So I wrote this in mind to help those who may need just a boost just to get over the hump in adding greens to your daily diet. Yes, as simple as that. Romaine, green or red leaf lettuce. Spinach. If I add in kale maybe 25% of the total mix . Raisins / Cranberries – (30 seconds) Adds a little sweetness to the overall taste. Be careful not to add too much as they can remind you that mother nature comes sweetened. Mushrooms – (1 minute) For this job once again a personal preference of crimini mushrooms sliced into the bowl. Should take about or a minute or less to thrown in. Take your time when chopping, safety first! Brown or Golden Flax Seeds – (30 seconds) A great source of omega-3, fiber, and other anti-oxidative properties. No preference in which you decide to use, they both are great superfoods. Chips – (30 seconds) I like to add chips instead of croûtons. Why? More for less. Organic chips only. Whole foods or Sprouts have a great selection that are very reasonably priced. Protein – (1 minute) I like to use boiled eggs because they are a great source of protein and taste delicious. Vegetarian/Vegan options can substitute tofu or lima beans in place of eggs. Dressing – (30 seconds) Now here is where things become interesting. The dressing can make or break your salad, so choose what you like. You can do something basic such as lemon and olive oil, or you may chose to use a commercial brand dressing. The problem with many of the store bought brands lie in the production of the dressing which may contain preservatives and ingredients that are “undesirable”, so try an organic brand from Whole foods, Sprouts, or your local farmers market just to obtain peace of mind. There are plenty of recipes online if you’re looking at making your own healthy dressing. I experiment with recipes and utilize what works best for me and I encourage my patients to do the same. I hope this guide provides you some insight on how to create a delicious, nutritious meal in 10 or less minutes. By the way, take your time and enjoy the process.